If you’re looking for an amazing place to settle down and stargaze, Colorado provides plenty of locations to choose from. Whether you lie under the heavens of the San Luis Valley, or get a little closer to the stars on the peak of a stately fourteener (a peak that stands above 14,000 feet), there is nothing like seeing constellations speckled across a clear Colorado sky. This national park near Alamosa is already otherworldly during the daytime; at night, it’s easy to imagine you’re on another planet. It’s also one of the only wild places in the world where rangers encourage self-guided exploration … in total darkness! To take a gorgeously surreal night-hike without the aid of a ﬂashlight, plan your visit during a full moon. You may be treated to glimpses of the local wildlife, including owl, kangaroo rat, coyote and even bobcat. If you’re more interested in sky than sand, go during a new moon instead; pick up a free star chart and moon calendar at the visitor center. A variety of guided programs are also available during the summer — check the night sky program schedule prior to your visit. Getting There: Located at 11999 Highway 150, Mosca. Plenty of rest stops along County Road 38E near Fort Collins have picnic tables overlooking the reservoir below. Since not many cars pass by at night, you're offered an uninterrupted view of sparkling skies. If you’re in the mood for a bit of a hike with a fabulous ending, head to the top of Horsetooth Rock — a bizarre rock formation that resembles an actual horse's tooth — for a view of the city on one side and the rugged mountains, Horsetooth Reservoir and the stars on the other. Getting There: Located on County Road 38E past Taft Hill Road. The rugged landscape of Curecanti, between Gunnison and Montrose, is a necessary beauty for everyone to experience. Come here on a clear night, and you’ll be certain to witness plenty of distant planets, stars and faint stardust — a glowing cloud of stars too far away to be separated by the naked eye. If the water is still, you may even catch a glimpse of the Milky Way in its reflection. Three sprawling reservoirs mark the heart of Curecanti, beginning with Colorado’s largest body of water (Blue Mesa Reservoir), followed by Morrow Point Reservoir at the entrance to the Black Canyon of the Gunnison National Park and the East Portal. A location as vast and unpopulated as this is a rarity. Getting There: Located at 102 Elk Creek, Gunnison. Jackson Lake State Park near Fort Morgan in northeastern Colorado is one of the most scenic places to watch the Colorado sky. With its large, glassy surface, the lake acts as the perfect mirror for the Milky Way. Known as “the oasis in the plains,” this park has been ranked as one of the top 15 park beaches by Reserve America. The peaceful silence of the evenings, the sandy beaches and the breathtaking view of the stars at Jackson Lake are enough to clear even the most occupied mind. Getting There: Located at 26363 County Road 3, Orchard. Not only is this all-natural amphitheater in Morrison one of the world’s most desired music venues for bands, it’s also a beautiful place to spend an evening stargazing. With its panoramic view of the city of Denver beyond and the solitude of a mountainside setting, Red Rocks is truly a gift of nature. The best time to catch the stars during one of Red Rocks' summer concerts or Film on the Rocks. Getting There: Located on West I-70 just past the Morrison Exit 259. Q: What’s more breathtaking than a Colorado summer-night sky? A: A summer-night sky in Rocky Mountain National Park, where the stars become a glittering canvas framed by the park’s world-famous topography. Throughout the summer, a dedicated team of rangers (accompanied by volunteer astronomers) leads a variety of special after-dark programs, including Astronomy in the Park and Stories Behind the Moon and Stars. And in July, the park hosts its pinnacle stargazing event, the Rocky Mountain National Park Night Sky Festival: three days of ranger-led daytime activities, educational talks and nighttime viewing. Getting There: Enter through the gateway towns of Grand Lake (west side) or Estes Park (east side). Prefer your constellations with a side of civilization? Located about an hour west of Pueblo, the two towns of Westcliffe and Silver Cliff recently became the first communities in Colorado to be recognized by the International Dark-Sky Association. Not surprisingly, the area is home to many passionate stargazers; soon after receiving certification, the community constructed the Smokey Jack Observatory, where visitors can absorb the full impact of an unobstructed Milky Way through a fancy-schmancy, computer-guided Schmidt-Cassegrain telescope. The local International Dark-Sky Association chapter also hosts a series of Star Parties throughout the summer. Getting There: 115 S Adams Blvd., Westcliffe (Smokey Jack Observatory). Surrounded by some of the most rugged and majestic Rocky Mountains, Trinidad's Monument Lake offers a great place to look at the stars. Known as southern Colorado’s Jewel of the West, the area’s crisp, mountain air and unparalleled views of the Sangre de Cristo Mountains create ideal locations to step away from the clutter and commotion of the city. Getting There: Located west of Trinidad on scenic Highway 12/Highway of Legends west for 35 miles. You’ll have no problem satisfying your nocturnal pursuit of Cassiopeia or the Big Dipper when you situate yourself next to Grand Lake. Aside from the charming atmosphere of the town of Grand Lake, very minimal light stands in the way of ideal stargazing, making any view a good one. During the winter months, ice skate under the stars at Devil’s Thumb Ranch or try night skiing at Ski Granby Ranch. It’s hard to beat the number of stars you’ll see on your lift ride up the mountain. Getting There: Located at 3530 County Road 83, Grand Lake. By day, Chimney Rock National Monument, located at the southern edge of the San Juan Mountains in southwest Colorado, is a breathtaking blend of nature and culture. Amid the windswept forest, the archaeological ruins and ancient artifacts of the Chaco culture have remained largely unchanged for 1,000 years. By night, ancestral wisdom and modern telescopic technology meet — with unique Night Sky Archaeoastronomy Programs ideal for visitors of any age. During the two-hour programs, visitors of all ages learn how the Chaco people used the stars for navigation, timekeeping and spiritual guidance. Getting There: 3179 Highway 151, Chimney Rock. Bordered by the vast open spaces of western Colorado near Montrose and Gunnison, Black Canyon of the Gunnison National Park has always been a phenomenal place to see the stars. In 2015, the canyon received the International Dark Sky Park designation, officially making it one of the best places in the world to go off-grid for a few hours. The Black Canyon Astronomical Society, in partnership with other local star-gazing groups, conducts nighttime programs throughout the year — using both telescopes and the naked eye — with experienced astronomers and astro-photographers on hand to assist visitors in the darkness. Getting There: Located 7 miles north on Highway 347 from the intersection of Highway 50 east of Montrose (South Rim) or 11 miles southwest of Crawford off Highway 92 on Black Canyon Road (North Rim). This San Juan Mountain beauty in Silverton sits along the scenic Million Dollar Highway (a million dollars' worth being the price of the views), and is the ideal respite for a bit of Milky Way-canopied solitude. By day, you've got the sharp pinnacles of the surrounding peaks, the fish-stocked lake (which also mirrors those peaks to breathtaking effect) and access to miles and miles of hiking trails. The Molas Lake Campground has a handy general store and other amenities, but is missing one important one for the stargazer's purpose: electricity. The area is nice and dark to assist with this starstruck adventure. 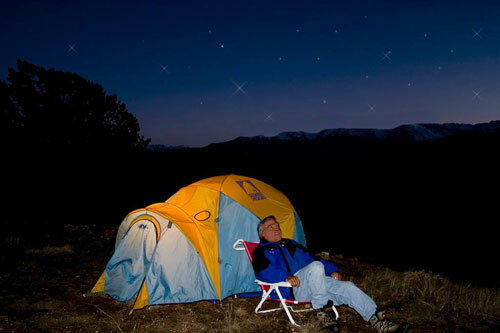 The best way to enjoy our starry nights? Slumber under them. Pitch your tent amid lush and fragrant sagebrush in the beautiful Yampa Valley near Steamboat Springs. Highlights include dark skies, easy access to sparkling Blue Mesa Reservoir and 93 miles of shoreline for exploring. Tucked in a canyon within the park, this incredibly quiet campground is just half an hour's drive from Mesa Verde’s famous archaeological sites. Encounter the alpine landscapes of your dreams at campsites nestled in the forest on the banks of the Roaring Fork River. Unobstructed views of southwest Colorado’s San Juan Mountains steal the show at this gem situated along the San Juan Skyway.